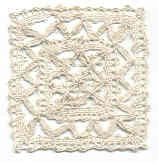 100% Cotton lace insertation, 1/2", Ecru, 5 yard cuts. 100% Cotton lace, 5/8", Rosey beige, 5 yard cuts. 100% Rayon, 1/2" wide, Black, 10 yard cuts. 100% Cotton Vintage Lace, White, 1 3/4" wide, 1 yard cut. 100% Rayon, Vintage Trim, Ivory, 10 yard cuts. Woven vintage braid with silver beaded trim. Color blue, 2 yard cuts. Antique Vintage Trim made in Germany. 1/4" wide (6mm), 5 yard cuts. Antique Vintage Beaded Trim, 1 yard cuts. Pink antique vintage 100% cotton insertion lace. 7/8" wide (22mm), 5 yard cuts. Color pink. Vintage flat braid, Cream & gold metallic, 3/16" wide, 10 yard cuts. Interesting braid from "West Germany" Pink & Blue woven braid. 1/2" wide, 5 yard cuts. Vintage scallop edge flat braid. Cream, 3/8" wide, 10 yard cuts. Very nice, Soft double edge picot trim. 3/16" wide, 100% Rayon, 10 yard cuts. 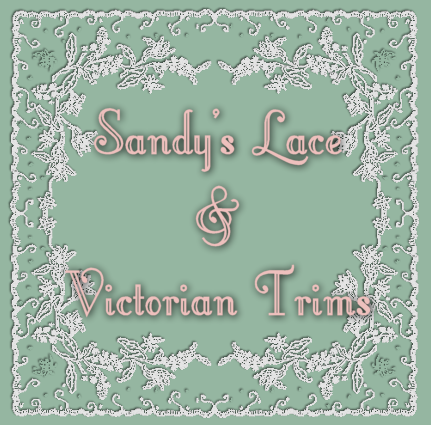 This is an interesting old vintage trims. 1/2" wide, in several colors, white/gold, white/silver, white irresident, 10 yard cuts. These are 100% cotton, 2" square, sold 1 each. Vintage, 1/16", Twisted cord, Chenille, Rose wrapped cord. 10 yds.